If space is the final frontier, we pilgrims have a lot to learn. To date, we’ve rarely ventured far beyond the thin envelope of Earth’s atmosphere. Why? Because we can’t yet survive long in space without dangling a supply line into the gravity well. Last weekend, however, we took a step that may prove crucial to foregoing our Earthly dependence. Made In Space—a Singularity University company dreamed up at SU’s 2010 graduate studies program—launched the first 3D printer into space. Once installed and fired up, Made In Space cofounders Aaron Kemmer, Jason Dunn, and Mike Chen believe a new era will begin. An era in which we manufacture what we need when we need it in orbit, deep space, the Moon, Mars, and beyond. Of course, we’ve been 3D printing objects Earth-side for a few decades. Why, you may wonder, hasn’t this been done before? Simply put, it’s complicated. On Earth, gravity naturally pulls a 3D printer’s liquified plastic out of the print head. In orbit? No such luck. Further, convection, also due to gravity, predictably transfers heat to and away from the plastic. In space? No convection. Also, 3D printers emit noxious fumes—not ideal in an enclosed box 200 miles from the nearest breath of fresh air. Made In Space cofounders, Jason Dunn and Mike Chen, testing their tech in simulated microgravity. It took four years and 500 parabolic flights on the “vomit comet” to engineer a solution. The end product, called the Zero-G Printer, can print in low gravity, is robust enough to survive launch, and has been deemed safe by NASA. The Zero-G was originally slated to launch on the latest SpaceX resupply mission in August. But the mission was delayed to September (not a rare occurrence) due to various scheduling and technical issues. Then at the scheduled launch slot early last Saturday morning—more delays. This time it was uncooperative Florida weather. Instead of disappointment, however, the repeated delays only further strengthened the team’s resolve. These glitches and postponements, stops and starts—and general lack of dependability—are why 3D printing may well change space exploration for good. As it happened, they didn’t have to wait until Tuesday or Thursday. 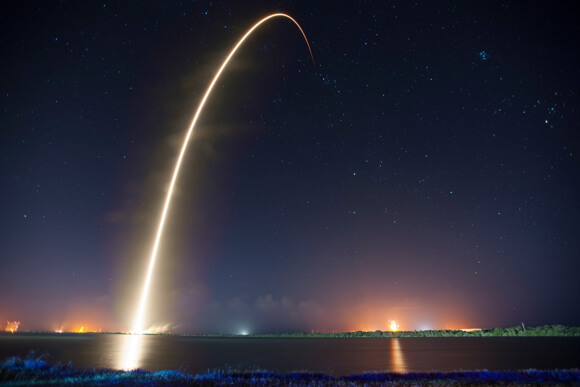 The SpaceX Falcon 9 launched on Sunday and hooked up with the space station yesterday. Made In Space 3D printer and 3D printed tools. Once the printer is set up on the station, it will establish a link to Made In Space and begin printing. Early prints will be small plastic patches or “coupons” to test the plastic’s properties. Other items will include a range of plastic tools and a student designed object. All this is just a first step, however, on a broader, more ambitious agenda. After returning the first objects printed in space to the ground for extensive testing, the firm will begin crafting a bigger printer, capable of printing tougher plastics. 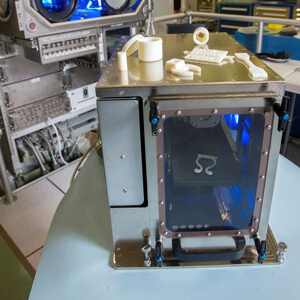 The second-generation printer, dubbed the Additive Manufacturing Facility, will fly to the space station next year. Beyond being available for the astronauts to use, it will function as an open platform—anyone on the ground will be able to apply to use the printer for their own projects. In addition to providing the means to manufacture tools and parts for use on the space station, it’s hoped the printer will also speed up innovation of space technologies. Instead of waiting years to iterate on designs, engineers can more rapidly test them for space-worthiness week in, week out on the printer. Or researchers will send up the guts of a cubesat—tiny satellites 10 cm on a side—in a flat, space-saving stack of circuit boards and have an astronaut print and assemble the satellite’s frame onboard. Future models will expand the printer’s selection of materials—diversifying from plastic to metal, for example—and further down the road, a Made In Space recycling facility will allow broken or obsolete tools to be melted down and reprinted. Though early generations will print small items in Earth orbit, 3D printing may be key to further exploration of the final frontier. The printer works in microgravity, but it should also work on the Moon or Mars. Indeed, the team envisions robotically printing structures on other planets using the resources available—truly living off the land. They are, in fact, already developing a way to 3D print using simulated moon dust. Though 3D printing tech is nowhere near Star Trek’s magical replicator—the technology aims to solve the same problem. And it already does a pretty good job. To journey into deep space, to set up shop on Mars, to go where no one has gone before—we need near complete self-sufficiency. If Made In Space has their way, no future space adventurer would break Earth orbit without their trusty 3D printer onboard.